Photography comes natural in Krakow. It’s a picturesque city with plenty of scenic places and it has much to offer all camera-toting visitors. Notably the Old Town of Krakow at the heart of the city, the nearby Kazimierz district, and other historic spots as well as the rustic environs may reward any photographer and/or cameraman. 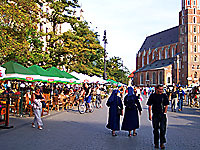 Also, Krakow is rich in festivals and other lively events that provide plenty of attractive photo opportunities for memorable snapshots or videos. Generally allowed, taking photos is restricted in some places. As a rule, outdoors you can shoot photographs or a film in public spaces at will. Yet indoors, the use of camera is restricted one way or another in most places of interest in Krakow. Even sites with free admission, such as churches, often display a ‘no photo-taking’ sign by the entrance. Elsewhere, including the Wieliczka Salt Mine and the church of the Virgin Mary’s they charge little extra for taking pictures or making a film. And there are popular tourist attractions in Krakow, notably the Wawel Royal Castle, where shooting photos and/or videos is forbidden. Fortunately, the city has also such places as the Old Synagogue together with other branches of the City of Krakow Historical Museum, the Archeological Museum, and most branches of the National Museum in Krakow (with the notable exception of the Princes Czartoryski Museum) that allow cameras free of charge. Also, please note that most museums and other institutions prohibit the use of flash and tripods (as well as selfie sticks!) even as they permit making photographs or videos. Curiously, owners of businesses, even shopping centers, often ban taking pictures and videotaping on the premises. Their restrictions may be legally questionable but those ignoring them risk confrontation with a security guard. Tourist attractions in Krakow and the city center are full of avid photographers and nobody minds camera clicks in public spaces. On the other hand most people don’t like being photographed by strangers and unsolicited portrayals are considered rude and an invasion of privacy. But when asked, the locals often agree to pose for a photo or two. You don’t need to ask street artists in fanciful costumes ubiquitous in the Old Town, notably its central Rynek Glowny square – being photographed by and with tourists is their job so don’t forget to leave them some change. immense square from the late November through the early January. 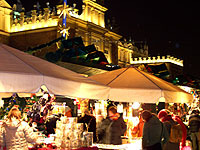 Photographic equipment and accessories are readily available in Krakow’s specialty stores, in electronics superstores, and even in computer shops. Their selection of goods and prices match similar enterprises in other cities of the European Union. Your digital photography may be turned into prints in service (or self-service) centers across downtown Krakow and at shopping malls. Many of them also develop rolls of film. In balmy weather Krakow restaurants spill over sidewalks in the Old Town historic district. Copyright © 2007-2019 by MAREK STRZALA. All rights reserved.